These versatile electro-luminescent strips give you the same flexibility of an EL wire but with more thickness for even bolder lighting designs. They're totally flat and give off bands of bright illumination, perfect for highlighting the inside or outside of your modded case or whatever you can think of! Each complete kit comes with a 24" inch EL strip that can be cut to any length and separate inverter for easy PC hookup. Brightest light output of any EL lighting currently on the market. Self-adhesive backing sticks to most anything - fully bendable and configurable. May be cut down to any desired length. Weatherproof casing for outside installations. Modular quick-connector design makes for quick and easy installations. Can conform to just about any type of surface, including bends and corners. 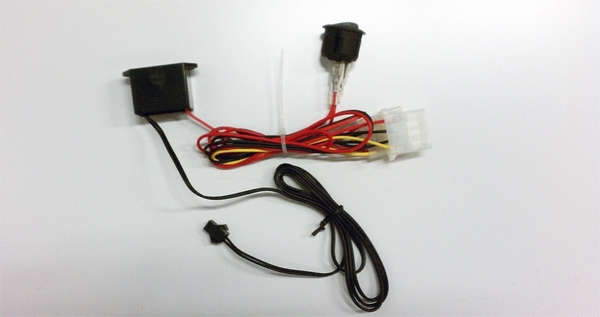 Works right off your computer's power supply, but can also be used with a 12VDC source such vehicle or home installations. Easily attachable to heatsinks, video cards, motherboards, cases, fans, water tanks, keyboards, mice, monitors, printers, mousepads, desks, speakers, and more! Kit comes complete with 24" strip, power inverter and quick connect cables. Xoxide Zach says - These new EL wire strips are awesome! They combine the brightness and luminosity of EL wire with the convenience and flexibility of an LED strip! They’re a great choice for ambient lighting anywhere you put them! I even used a white one as accent lighting behind my TV, and the blue ones provide a very cool effect under my bar counter!